Ever think about your attic as a place to eke out additional storage or squeeze in a spare bed? You're not alone. Here, the considerations homeowners must make before setting off to lay out any old flooring in the attic. With the high cost of new construction preventing homeowners from adding square footage to their homes, many are understandably looking to make existing space work harder for them—including any unfinished space. 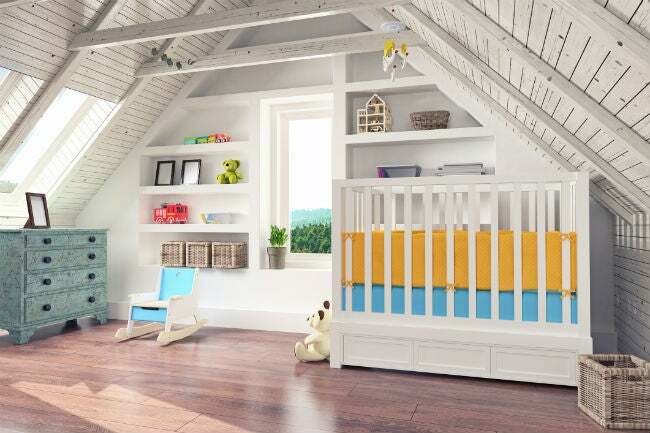 Attics are a top pick when homeowners decide to gain some extra storage or add a guest room, but not all attic flooring structures are up to the task of supporting the weight of a new living space. If you’ve ever wondered whether or not your attic would support decking for storage or, even better, a loft conversion, keep reading. We’ll explain the most important factors and how to find out what you can safely do with your attic space. CAN YOU ADD ATTIC FLOORING? • If your joists are 2x6s or 2x8s, they are not adequate for supporting attic flooring in a new living area (and the furnishings and humans who will use them). • If the joists are larger, they might support attic flooring, but the only reliable way to know for sure is to have a structural engineer take a look at your attic support system. In some cases, even larger joists will not support a new living area, so it’s vital that an engineer take a look. Beyond the size of joists, the spacing between them should also be taken into consideration. Standard joist spacing for the installation of attic flooring materials is 16 inches on center (OC), meaning the distance from the center of one joist to the center of the next joist is 16 inches. Joists in attics that were never intended for the installation of flooring or conversion to a living space are often 16 inches OC or 24 inches OC. If your existing attic flooring isn’t adequate for conversion to a living space, all is not lost. Virtually any attic floor can be brought up to code—it’s just a matter of how much additional structural support it will require. Modifying an attic floor’s joist system is a job for the pros. But before even they can start on a job that involves altering your home’s structure, they’ll almost certainly have to pull a permit. This involves submitting a plan of the intended modifications to the local building authority, who will analyze the plans and issue a remodeling permit if the plans meet building codes. Only then can they get to work. • Bridging: If the existing joist system is very close to being sufficient to support a new attic flooring, the addition of bridging between the joists may be all that’s required. Bridging involves cutting new wood members and installing them perpendicularly between the existing joists. This serves to stabilize the joists and reduce sagging. Bridging is usually installed in every joist space, and multiple bridge members are often required. • Sistered Joists: Depending on the existing attic structure, a contractor might be able to “sister” the current joists by attaching new joists of the same dimension beside them. Sistered joists bear on (rest on) the same load-bearing walls as the existing joists, but they also attach directly to the old joists; the two are bolted snugly together to reduce the risk of sagging or breakage. • Addition of LVLs: Laminated veneer lumber (LVL) is manufactured through a heat and pressure process that produces wood beams that are much stronger for their size than ordinary wood. Depending on your attic structure, an engineer may recommend the installation of LVLs between the existing joists to bring the floor structure up to code. • Addition of Engineered I-Joists: I-joists, so called because they resemble the capital letter “I” from the end, are designed to support typical floor loads (weight). The engineer may recommend installing I-joists above, or alongside, the existing joists to add structural support. When houses are constructed, specific walls are selected to be load-bearing walls and designed to support the weight of the structure above them. 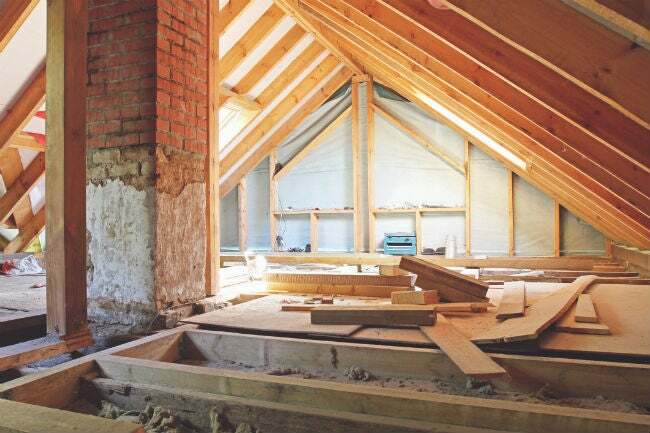 Houses that have been constructed with the idea of finishing out a future living space in the attic will not require joist reinforcement nor additional vertical reinforcement. If your home wasn’t designed to support a future attic conversion, not only will the joist system require modification, an engineer may require additional vertical reinforcement installed in the floor(s) below the attic to support the new attic weight. This could involve installing structural posts in one or more areas of the home (which can often be hidden within an existing wall). Other structural issues are also factors, including whether there is adequate space to install a stairway to the attic. Building code often requires stairway access to the attic if the space is to be used as a bedroom. If you intend to install only a sitting loft, you might get by with just a ladder. 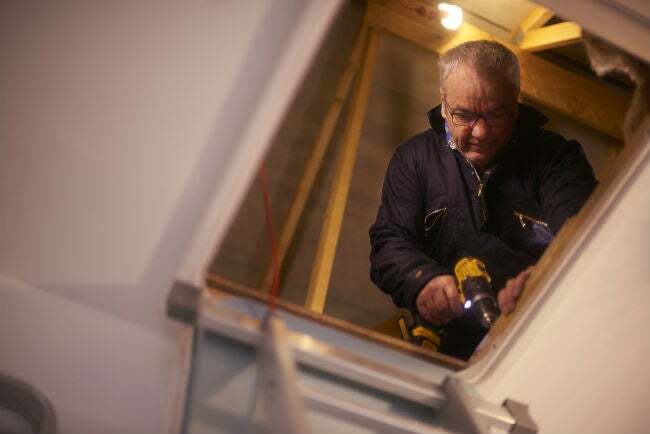 The headroom in the attic will determine how much usable floor space you have. While local codes vary, many communities will not permit the ceiling in a finished living area (attics included) to be lower than 6’ 8” to 7’6” from the floor. That doesn’t mean you can’t use the attic areas where the sloped ceiling is lower; that space just won’t count toward your home’s official living space. For example, you could construct storage cabinets or cubbies in the low-sloped sides of the attic; when an appraiser measures the square footage of the finished attic, though, only the portion where the ceiling meets minimum height standards will be recorded as living space. A limited amount of usable floor space can obviously impact how you intend to use the space. Small bedrooms are cozy set in an attic with slanted ceilings, but you may want to reconsider your plans if your usable floor space doesn’t fit much more than a bed. If your attic joists won’t bear the weight necessary to finish out a living space but the engineer cleared them to support floor decking for light storage, you can install ½-inch plywood or oriented strand board (OSB) in 4-foot-by-8-foot panels over existing 16-inch OC joists. For joists spaced 24 inches OC, use thicker, ¾-inch plywood to prevent sagging between them. If you’re familiar with basic carpentry and framing techniques, installing decking for attic storage is a DIY-friendly project. Just remember: This type of attic flooring will provide storage space for overflow items and seasonal items, but it won’t pass muster as a living space floor. 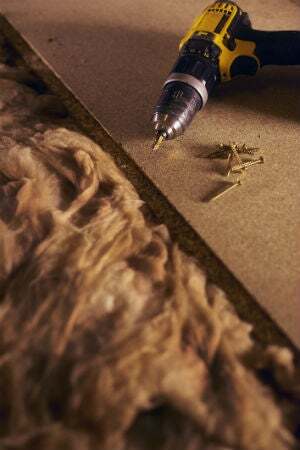 Attic flooring intended for a living space must be installed in compliance with building codes. Some communities will allow homeowners to do their own construction, but they are still subject to all inspections required by the building authority. Accepted floor decking for a living space is typically ¾-inch tongue-and-groove subflooring, glued and screwed to the joists. The manufacturer of the subflooring may specify an attachment pattern, such as one screw every 6 inches along the edge of the panel and every 8 inches in the field (center of the panel). 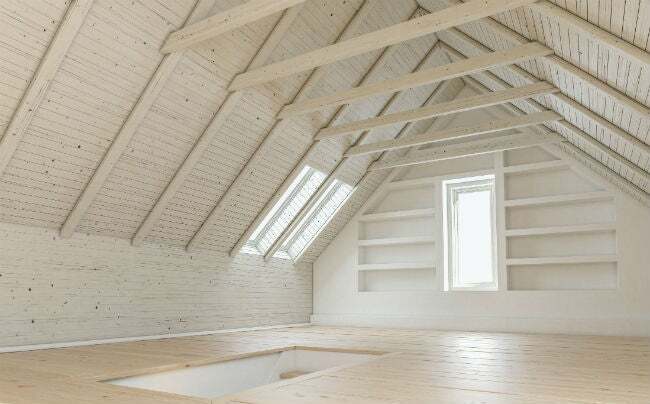 Even if permitted by your community, converting an attic to a living space is a complex project that most homeowners are not prepared to tackle. It involves installing outlets, switches, and (potentially) water-supply lines and drainage pipes if a bathroom will be added. Attics are fresh-air ventilated so provisions must be made to reroute the attic’s ventilation through the rafter spaces and the rafters must then be insulated. An attic conversion is a great way to expand your home’s living space, but best to leave the work to a licensed contractor.